On 28 August, the Joint Monitoring Programme for Water Supply, Sanitation and Hygiene (JMP) released Drinking Water, Sanitation and Hygiene in Schools: Global baseline report 2018. The JMP, comprised of UNICEF and WHO, has reported country, regional and global estimates of progress on drinking water, sanitation and hygiene (WASH) since 1990, and in 2015 developed a five-year strategy to enhance monitoring and realization of access to WASH globally. To go along with the new report, the JMP has developed new service a new monitoring mechanism to enable schools to track progress in regards to providing access to water, sanitation and hygiene (WASH) and compare with other countries. There are clear links between human rights-based social protection, water and sanitation, education and gender equality. The 2030 Agenda explicitly calls for universal access to WASH, social protection, gender equality and the empowerment of women and girls, and safe, inclusive and effecting learning environments. 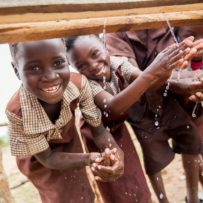 To that end, this new report is the first comprehensive global assessment of WASH in schools and establishes a baseline for the sustainable development agenda. The JMP has also provided an online data visualization tool on the UNICEF website to allow stakeholders to easily compare progress towards achieving WASH in schools. The global effort to achieve sanitation and water for all by 2030 is extending beyond the household to include institutional settings, such as schools, healthcare facilities and workplaces. This has been reinforced by global education for all strategies highlighting how water, sanitation and hygiene (WASH) in schools improves access to education and learning outcomes, particularly for girls, by providing a safe, inclusive and equitable learning environment for all.